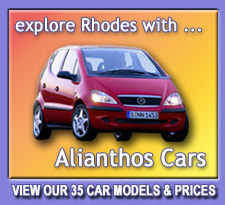 Rent a Car to explore Rhodes with Alianthos! ALIANTHOS Rhodes Car Rental company welcomes you to sunny and beautiful Rhodes, an island of unique and unforgettable experiences. Our company offers high quality rent a car services in low prices and special internet offers. no extra charge on after-midnight arrivals, delayed arrivals etc. free baby and child seats, roof racks, city maps etc. 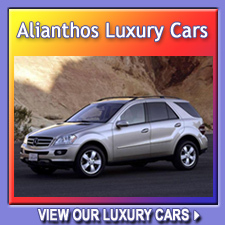 Alianthos Rhodes Car Rental company is dedicated to make your vacation in Rhodes memorable and relaxing. Our company allocates a central office in the capital city of Rhodes, and many delivery points in the island for your best service. So, you can rent a car in Rhodes by visiting our central branch. Alternatively, our staff will be at your service delivering your choice of vehicle at the Rhodes airport, the Rhodes port, your hotel or wherever it is convenient for you, in more than 30 delivery places all over Rhodes, as shown below. Rent a car in Afantoy, Kolimbia, Kallithea, Tsambika, Koskinou etc. Rent a car in Lindos, Ialyssos, Trianta, Embona, Pefkos, Haraki, Kalathos, Lardos, Genadi etc. Low rates - High standard services: Alianthos Rhodes Car Rental company offers the most competitive rates in Rhodes, because we are an internet based company with a large fleet of cars. With Alianthos, you get more for your money, plus personal attention and quality service. You will not find a better combination of price, quality and service as offered by our company. No hidden costs: Our car hire prices are so attractive because many of the services that we offer are FREE of CHARGE for which other companies will either openly charge you or hide the additional cost till the end of the day. Our priority is your contentment: Fast and friendly customer service is our highest priority. This is Alianthos's commitment to customer satisfaction. A commitment you can count on day in and day out. New, safe vehicles: Our company can offer you many car hire categories of new vehicles equipped with the latest technology, with which you can tour all around the island in safety and peace of mind. We can be everywhere you wish us to be: Our staff will be at your service delivering your choice of vehicle at the Rhodes Airport, the Rhodes Port, your hotel or wherever it is convenient for you.